Surgery is infrequently indicated for patients with vestibular diseases, being limited to those in whom all attempts of clinical treatment result in failure. This chapter reviews the diseases that may need surgical treatment, as well as the techniques available. Ricci G, Di Stadio A, D’Ascanio L, La Penna R, Trabalzini F, Della Volpe A, Magnan J. Endoscope-assisted retrosigmoid approach in hemifacial spasm: our experience. Braz J Otorhinolaryngol 2018. pii: S1808-8694(18)30179-4. https://doi.org/10.1016/j.bjorl.2018.03.015. Gorrie A, Warren FM 3rd, de la Garza AN, Shelton C, Wiggins RH 3rd. Is there a correlation between vascular loops in the cerebellopontine angle and unexplained unilateral hearing loss? Otol Neurotol 2010;31(1):48–52. https://doi.org/10.1097/MAO.0b013e3181c0e63a. Guinand N, Van de Berg R, Cavuscens S, Stokroos R, Ranieri M, Pelizzone M, Kingma H, Guyot JP, Pérez Fornos A. Restoring visual acuity in dynamic conditions with a vestibular implant. Front Neurosci, 2016;10. https://doi.org/10.3389/fnins.2016.00577. van de Berg R, Lucieer F, Guinand N, van Tongeren J, George E, Guyot J-F, Kingma H, van Hoof M, Temel Y, van Overbeeke J, Perez-Fornos A, Stokroos R. The vestibular implant: hearing preservation during Intralabyrinthine electrode insertion—a case report. 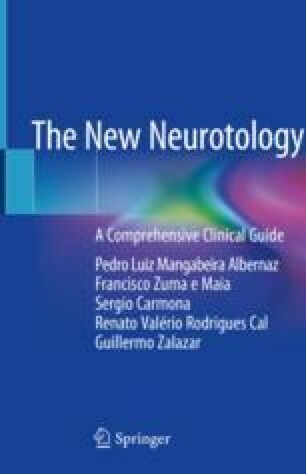 Front Neurol 2017;8. doi https://doi.org/10.3389/fneur.2017.00137.